I am going to Cartagena. Can you believe it! 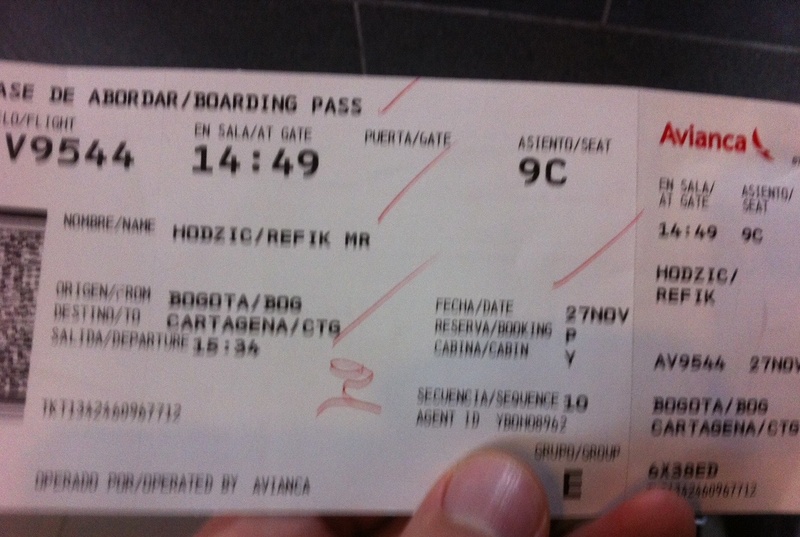 I am going to Cartagena!! Yes, THAT Cartagena, the magical place on the Caribbean coast of Colombia. Don’t ask me, I can hardly believe it myself. I only wish my grandfather Redzo was alive so I could tell him. I would call him, he’d pick up and shout with the might of a 93-yeard old deafness. Modulated voice announcing boarding for the Avianca flight 9544 from Bogota Eldorado to Cartagena des Indes rudely interrupts and my grandfather goes back to being dead. How I want to be able to speak Spanish. I tried once and it didn’t work out, my daughter’s teacher stole the Rosetta Stone activation code and in return gave me the excuse for not doing the necessary work and learning this beloved language. Instead, I am straining to understand what the announcement says, as if the bursting of the largest vein on my forehead will lead me to Spanish enlightenment. SomethingsomethingochosomethingAviancasomethingsomethingCartagenasomething… I am relieved when people around me start getting up and forming a line to board. With considerable glee I pull out my Silver Miles and More Card and cut in to join business class immortals in the priority boarding lane. The attendant smiles as she take the boarding pass. I smile back as much as my face will allow without spasming. She scans the pass, but nothing happens. Again, nothing. No beep, no green light. “I check,” says Carolina Perez. “Is something wrong?” It was going too smoothly. It never goes smoothly. Carolina Perez types my name into the computer. Frowns. Types something else. Frowns more. I step aside and a short guy in a dark blue suit and white shirt triumphantly scans his boarding pass throwing me a superior glance of a winner who never has to step aside. A blow, yes, but I am not defeated. Yet. Determined to be in Cartagena today, and not tomorrow, I run down the line of gates from 86 to 72 where my eyes feast on the sight of an Avianca help desk. Out of breath, I zero in on one free teller. “No, senor,” says Aurelia Flores. I desperately turn around with a pleading look, hoping to locate a friendly bilingual face. Nothing but blank, slightly annoyed stares. “Si, manana,” nods Aurelia. My god, she is gorgeous with her raven hair and piercing blue eyes of that Afghani girl from the cover of National Geographic. “No, senor. I can’t change your ticket. You have to go to the passenger office and change the ticket there. The office is on the first floor, to the left of the exit,” explains Ms. Flores in perfect Spanish of which I did not understand a word. The exchange happened in broken sentences of two incompatible languages and plenty of desperate nodding, head shaking, gesticulation, shouting and sighing. We got there at the end, Aurelia and I. Running through empty corridors, looking for the exit, with a dreadful feeling that I should not be there. Finally I see the baggage claim area, and the safety of a salida at its end. I am out, back in the throng of people greeting new arrivals, looking for checking counters, the especially sad congregating around the “lost baggage” office. 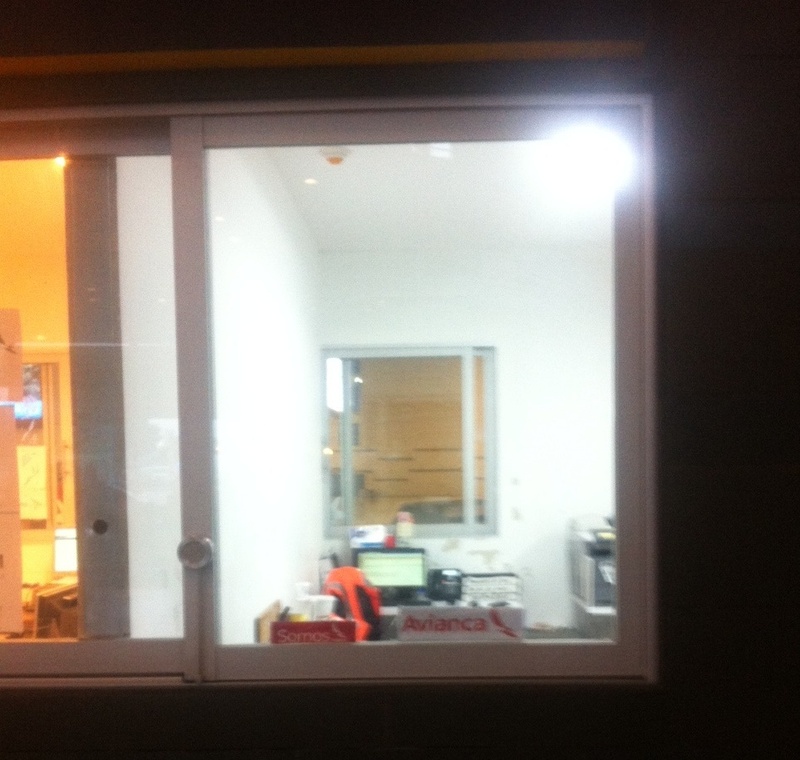 Beside it, the passenger office. “Do you speak English?” I am already soaked with sweat. “No, senor,” counters Maria Vargas, surely former Miss Colombia. Without waiting for my response he crosses over, gathers all the relevant information, speaks to Maria, she retorts that yes, she can change the ticket but it will cost me 50 dollars (at this point I would gladly give blood for a ticket) and that I have to go and get my bag, otherwise she can’t change it. But how, where, can’t she just reroute my baggage to another flight? I am heading towards the baggage tracking office before the last consonant of “No, senor” leaves her Aphrodite-red, juicy lips. Eons pass. I stopped looking into the glass window long ago. Phone battery is dead. I have no hope left. A knock on the glass. It is not Catalina, she is gone. A young, well-groomed man with a mop of dark hair on his forehead is speaking to me in English. 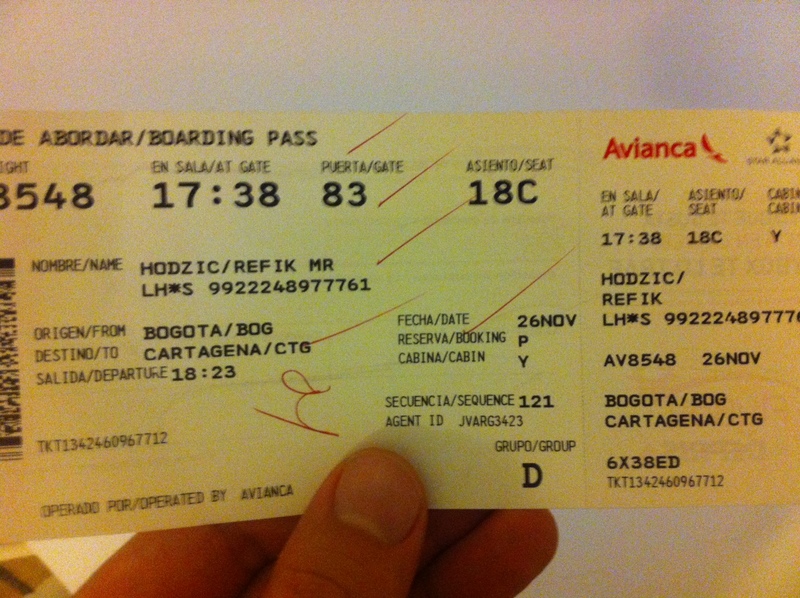 Fabian Vives comes around from behind the glass, takes my boarding pass, walks me over to the Avianca counter, says something brief and passionate to the teller and comes back with a new boarding pass. I hug him. I run. I pass the same security check. The same gate. Carolina Perez smiles a smile of thousand pearly sunrises. Scans my pass. Green light illuminates the world. I am on the plane. Typing this. I land. Humid Caribbean air fills my lungs. 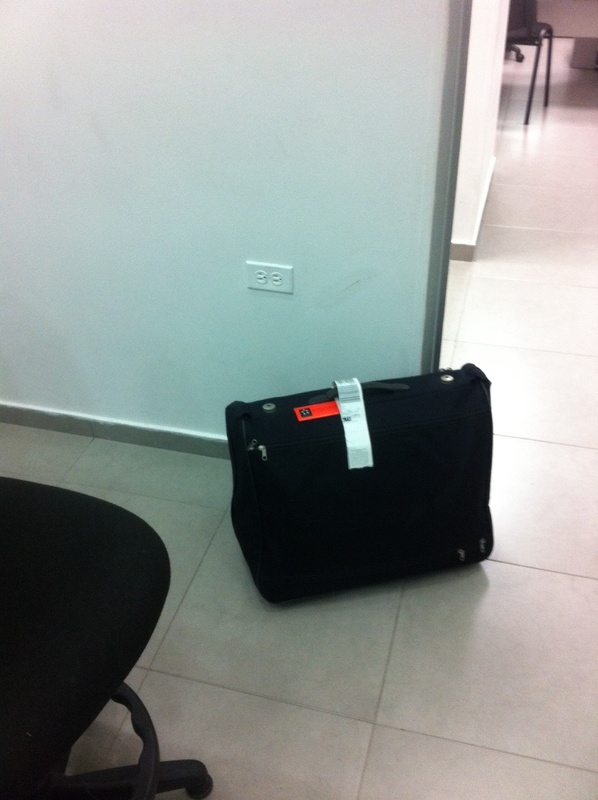 My faithful bag greets me at the lost baggage office. I am in Cartagena. The place where Gabriel Garcia Marquez wrote Love in the Time of Cholera, The General in His Labyrinth, and Love and Other Demons. This was the only right way to get here. “It always amuses me that the biggest praise for my work comes for the imagination, while the truth is that there’s not a single line in all my work that does not have a basis in reality. The problem is that Caribbean reality resembles the wildest imagination.” Gabriel Garcia Marquez, Paris Review, 1981.